With more vintage movies finally being remastered for Blu-ray, it's easy to get excited when a favorite title comes out. And sometimes viewers become frustrated when the HD transfer doesn't look as perfect as a new release. Kino has been revisiting its DVD hits and bringing out some surprisingly good remastered discs. Their DVD of Fritz Lang's Scarlet Street was a revelation after years of terrible dupes, and we have every expectation that the soon-to-come Blu-ray will be terrific. But other films originally shot in Technicolor often pose restoration challenges that can't be solved by a simple quality transfer. More on this below. 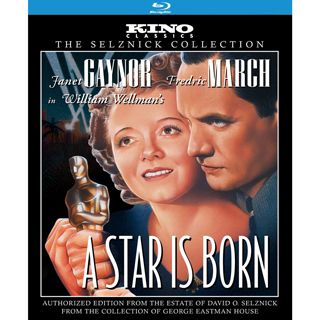 Legendary producer David O. Selznick scored an outsized hit with his showbiz 'expose' A Star is Born, one of the first titles produced in the new 3-strip Technicolor process. The work of his credited writers was second-guessed by a phalanx of pinch hitters that included Adela Rogers St. John, Ring Lardner Jr. and the ubiquitous Ben Hecht, all of whom were probably rewritten by Selznick anyway. The independent Selznick production was originally released through United Artists (man, if the pre-1950 UA pix were still part of the library...) but eventually fell into the public domain along with other popular classics like Stagecoach; this title unfortunately is still public domain. Savant first tried to watch it on television in the early 1980s and was shocked to see some 5th generation splicey mess; Image's budget-priced release has a few flaws but is far better than anything I've seen. The storyline is rags to riches, with some Hollywood heartbreak added for good measure. Unhappy farm girl Esther Victoria Blodgett (Janet Gaynor) lets her grandmother (May Robson) give her some money to run away to Hollywood, where she finds a friend in assistant director Danny McGuire (Andy Devine) but no luck in a studio system overrun by would-be hopefuls from the sticks. But then she meets alcoholic star Norman Maine (Fredric March), who gets her a screen test and then a leading role right off the bat. Under her new name Vicki Lester our girl zooms to instant stardom while Norman slides in popularity. Due to his drinking and poor attitude the studio is forced to give him up. Vicki is working more than ever, and eventually Norman decides that he's a millstone around her neck. There's this great Merrie Melody Warner cartoon, see, where a scrawny hick chick from Kansas wants to be a star. She traipses around the barnyard like Katharine Hepburn and talks in an affected voice. The silly cluck is picked up by a slick bantam in a convertible and given a humiliating Hollywood runaround. Eventually back home and married to a slackjawed farmer-chicken, she catches one of her own fat little chicks doing a movie star impersonation ("Yahs, Rally, I would") and socks her with a thrown boot! This cynical delight must have been inspired by A Star is Born, a film that is only half-realistic. The other half is just as dreamy-eyed as any con-man's line about "come along with me and I'll make you a star, little girl." Janet Gaynor gives a terrific performance by not looking ridiculous as the hayseed hopeful from the Midwest, desperately hoping to make it in Tinseltown. Few previous Hollywood-on-Hollywood movies had treated the subject seriously, with the funny Marion Davies silent Show People standing out as one of the better "be a star!" fantasies. Davies does this great schtick striking exaggerated facial expressions to prove what a great actor she is. Curiously, the only 'acting' Gaynor's wannabe Vicki Lester does are some dreadful star imitations while trying to attract attention as a waitress. A lot of A Star is Born is right-on for realism. Yep, it's true that a zillion babes arrived in L.A. to get their big chance, and only a tiny percentage found meaningful acting work. One of the better early scenes has the receptionist of a talent agency showing Gaynor a busy telephone exchange where operators repeating 100 times a minute that there are no jobs available. The direction is clear and to the point, a cornerstone of William A. Wellman's personal style. The former man of action proved to have a talent directing actresses. 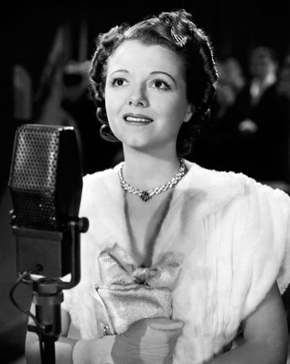 Janet Gaynor had featured in sentimental mini-epics since the silent era (Sunrise) and Esther Blodgett gives her an opportunity to play in a melodrama with some very realistic rough edges. Alcoholism as a serious problem was not a popular movie subject, and Gaynor and March present it in believable terms. Even more accurate is how Gaynor's Esther Victoria Blodgett gets her break. Clownish, sexless Andy Devine is a jolly pal but he can't do much for her. 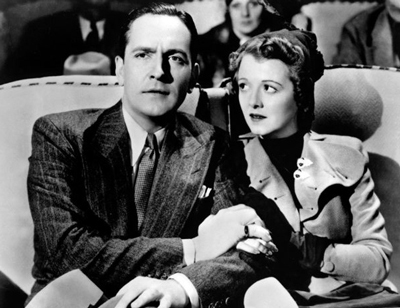 But Esther catches the eye of matinee idol Norman Maine, deftly played by Fredric March. It must be Esther's sparkling personality, because she's no looker in the standard sense. We just have to take it for granted that the girl from the corn belt has some magic light in her eye. That and the fact that the script makes sure that every other available female in the film is a contemptible snake. Now, Norman obtains a screen test for Esther and then a plum role based on nothing but friendship and good faith. We don't see the screen test. That much is credible enough, but the usual dispiriting truth of such arrangements is that the powerful person ends up sleeping with the hopeful wannabe and loses their judgment, if they had any in the first place. We never see Esther perform; yet from then on everything she does turns to gold. She just happens to have that magic that sends audiences, that elusive star power that Norman knows is slipping through his own fingers. The more cynical among us will mentally re-write Esther's part the same way we did Debbie Reynolds' Kathy Selden in Singin' in the Rain Esther uses Norman for all he's worth. A new life means a new identity for her as Vicki Lester; being renamed is like being reborn. It's a Depression - era fairy tale that millions of American females could relate to. Like most big Hollywood movies about The Movies, A Star is Born criticizes everyone but the producers. The big villain is Lionel Stander's loathsome press agent, Matt Libby. He pronounces Esther's original last name as if it's a disgusting bodily function, and has a psychotic need to kick Norman Maine when he's down. The rest of the town behaves identically. They're envious and resentful of the big star when he's on top, and eager to laugh at him when he's not. The producer Oliver Niles (Adolph Menjou, as benign here as he was malign in A Farewell to Arms) reluctantly signs Esther on the basis of Norman's say-so, and casts the complete unknown star into a major production as well. Esther thinks for a second that Oliver is making a move on her, right in his office. He instead turns out to be a sincere, helpful and truly loyal friend. That detail must have made lecherous predators like Harry Cohn feel really good. Niles is understanding and flexible with Norman's outrageous behavior. He never disassociates himself from the disgraced actor, even after a scandalous debacle at the Oscar ceremony. There's nothing in the show about producers overworking their actors, or running their love lives, or cheating them out of money or forcing them to work in crummy movies or feeding them drugs to keep them on their feet for long shooting days. Not that that was always the case. It would be more likely that Esther would be kept on as a contract player but used only as someone to dress up parties and perhaps get cozy with whoever the studio needed to entertain. Ask Shelley Winters. A Star is Born gets a lot of the atmosphere right, even if day-to-day Hollywood is overglamorized. The script handles Maine's drinking problem and Vicki Lester's attempt to do right by him with dignity and grace. Maine's sacrifice at the end was said to have been inspired by John Barrymore, if I remember my Hollywood Babylon correctly. No wonder Hollywood ate up A Star is Born: it's an affirmation of the town as a worthwhile place with some worthwhile people. There were just as many ethical movie people in the Golden Age as there were predators and fakes, and the script probably oversells the worst of the town in an effort to make Vicki and Norman seem as virtuous as possible. The picture was nominated for seven Oscars and won two: original story and cinematography. Beyond the leads, the acting in A Star is Born is functional but snappy, with Menjou and Stander doing fine work. There are a lot of good bits filled by familiar faces (Francis Ford, Franklin Pangborn) and some good unusual ones. Edgar Kennedy is Esther's sweetheart of a landlord. Jed Prouty is a reprehensible press agent who would be a good fit for Sweet Smell of Success. Among the starlets glimpsed at bars are Carole Landis (One Million, B.C.) and Margaret Tallichet (Stranger on the Third Floor). Kino offers two video extras, an original theatrical trailer and an odd wardrobe test. Four models pose in a fashion salon, and exit one by one. 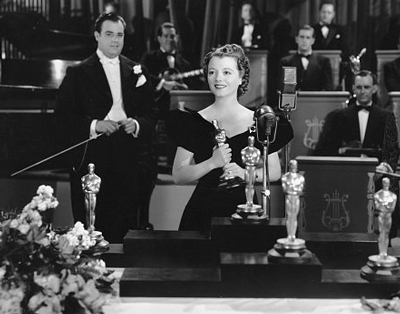 The last reveals Janet Gaynor standing in a white dress. Also included is a still and poster gallery, with original advertising images from the film. 1. And even if they did, don't hold your breath or expect a fabulous digital restoration to be performed. Some studios, especially Warners, have commissioned fantastic digital restorations on titles like The Wizard of Oz, going to amazing lengths with expensive new technology to transfer the three B&W Technicolor film strips separately, and then combine and align them in the digital realm. It's so expensive that only a few old movies qualify for rescue in this manner, titles that will generate enough income to justify the expense. A Star is Born is a famous picture among film historians, but it's not a practical candidate. Neither are hundreds of other terrific 3-strip Technicolor movies. Perhaps the price tag will eventually drop ... before the surviving elements for all of these films are lost to decomposition.